Reverberation is an important aspect of room acoustics and audio production. 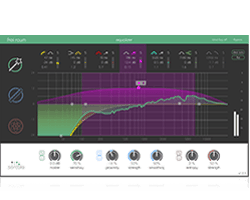 In this article we will explain what reverb is, define a few of its basic parameters and discuss the role it plays in our hearing perception and in music production. 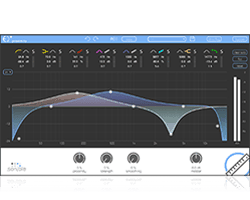 Reverb can also be referred to as room, resonance, and, less accurately, as delay, echo, or room resonance. Every room – whether open or closed – reflects sound waves in its own unique way. The concert hall, the stadium, the factory hall, the bar, the rehearsal room and the bathroom each produce their own characteristic reverberation for every sound event. Every space has its own acoustic fingerprint, so to speak. 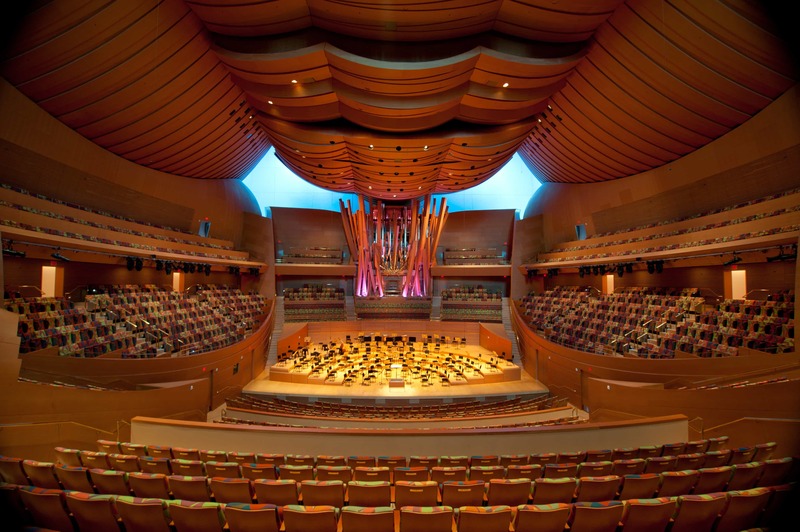 All the world’s great audio venues – such as Milano’s La Scala, the Vienna Musikverein, the Los Angeles Walt Disney Concert Hall or the Hamburg Elbe Philharmonic Hall – were designed and built with exacting detail and effort in order to obtain specific acoustic properties including desired reverberation times. Since music is recorded with microphones, the acoustic properties of the space in which we record must also be taken into account. So-called anechoic chambers, which don’t produce any reverb, feel extremely unpleasant (Daily Mail, “The worlds quietest place”) and recordings produced without reverb simply sound unnatural. Before the advent of electronic reverb technology, various techniques were employed to specifically capture and record a room’s inherent reverberation. Rooms without reverb are extremely unpleasant and unnatural. Early artificial reverberation devices include spring reverb and plate reverb, all of which work electromechanically. The electromagnetic tape delay, also from the early days of audio engineering, works with short delay times and audio filtering to produce reverb via a modified tape recorder. The first digital reverb devices made by EMT and Lexicon revolutionized music production in the 1970s. 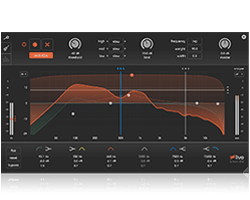 The digital audio domain of the 1990s brought the next major development in reverb technology. Now, twenty years later, convolution reverb technology brings new possibilities to audio engineering. 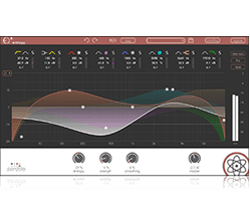 Convolution reverb digitally simulates the reverberation of a physical space by using pre-recorded impulse responses of the space being modelled. Impulse responses are the acoustic reactions to a standardized output signal, such as a short pulse (similar to a gun shot), white noise, or a frequency-modulated sine wave. Even when blindfolded, what we hear says a lot about our environment. How sound waves are reflected off walls and how long they need to travel certain distances reveals the nature of our immediate environment. These reflections, minus the direct sound from the source, are what we perceive as reverb. Reverberated sound can be broken down into a few distinct components: direct signal, initial, first, early and late reflections (diffuse sound). Our hearing has a very high degree of time resolution. Reflections of direct sound sources can be distinguished when they hit our eardrums 10 ms or more later. As sound travels at a speed of 343 m/s, after 10 ms it has travelled between 3 and 4 metres. Every audio reflection that reaches our eardrums sooner than 10 ms is combined with the original, direct sound; amplifying and adding colour to it. Acoustic reflections that occur before 10 ms can also produce undesirable comb filter effects. Audio reflections that reach our ears 20 – 50 ms after the original sound provide us with the most information about a room’s nature – its size, its surfaces and indications of its shape. 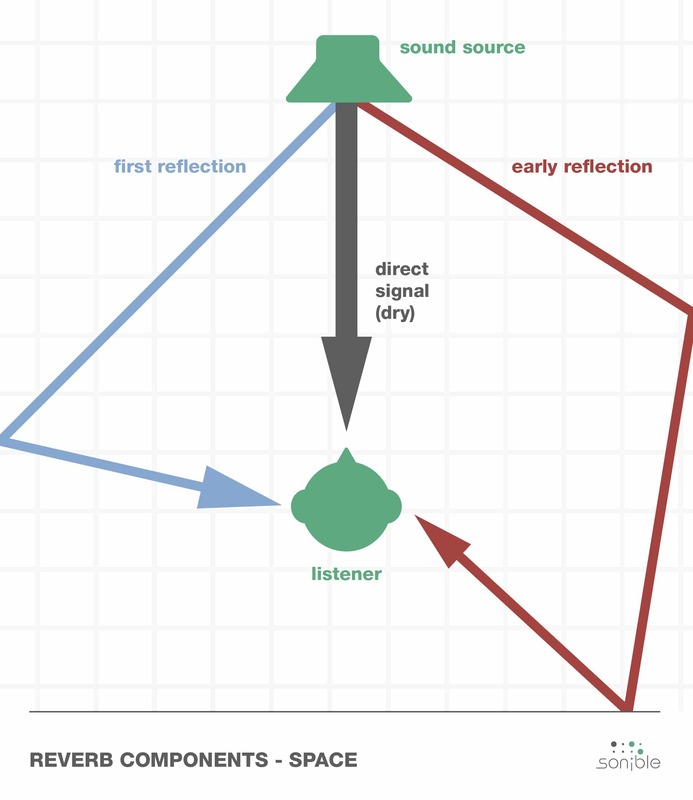 The temporal difference between early reflections and diffuse reverberation also contains important information about the listener’s distance from the sound source. 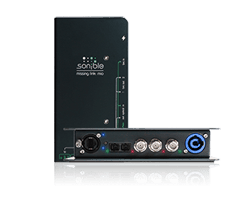 Reverberation of course plays a major role in audio and music production. 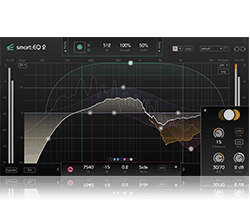 Artificial reverb-technology is an important tool used to provide a sense of depth in audio mixes. A creative approach is to use various different kinds of rooms in a single mix: the singer sings in a bathroom, the snare stands in a hall, the kick drum in a small, dry room and the guitarist in Wembley Stadium. Classical music productions on the other hand try to capture and reproduce the orchestral sound in its actual performance space and arrangement of instruments. A lot of reverb creates a feeling of distance – less reverb causes intimacy. Reverb is closely connected to the mood a sound conveys. 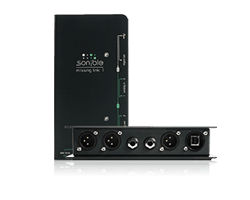 By using different reverbs one can create varying senses of proximity or distance. A large room makes a sound more powerful, making the listener feel small. A small room gives a more intimate feeling, allowing the listener to feel closer to the original sound source. Spatial proximity can give the impression that the singer is singing “especially for you”- a stylistic production device that is consciously used. Certain musical trends and differing musical styles of course play a significant role in choosing which of the various qualities of reverb to capture. Just think of the huge snare drum sound of the 1980s. Regardless, getting the right room starts by recording the right way. When recording, the first step is to determine at what distance from the instrument to place the microphone. A critical guideline for this is the reverberation radius. 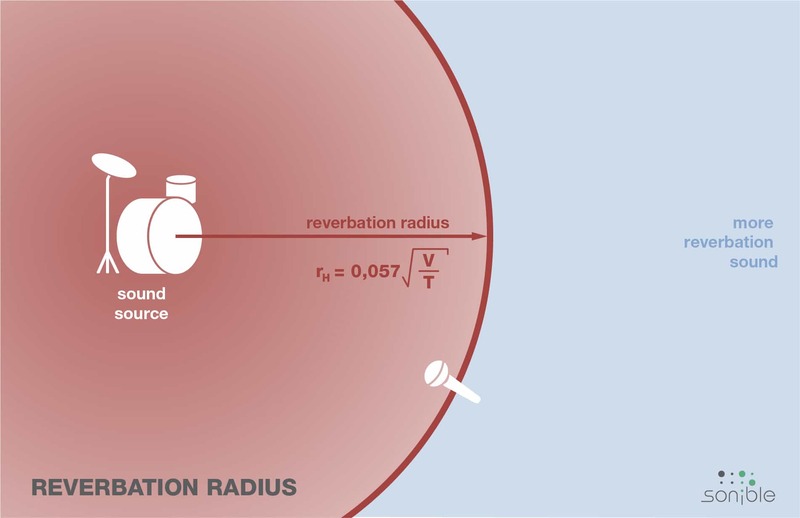 Reverberation radius is defined as the point between the microphone and sound source where the direct sound and the diffuse sound are of equal volume. If you place the microphone within this radius, the recording becomes drier and less spatial. Placing the microphone outside of this radius results in a recorded sound that is more diffuse and influenced by the reflections of the room. The exact length of the radius depends on the reverberation time of the room, the directivity of the sound source and the directional characteristics of the microphone. The use of ambient microphones is a common technique in audio recording. 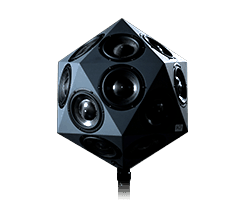 It allows one to record the room sound separately from the instruments. 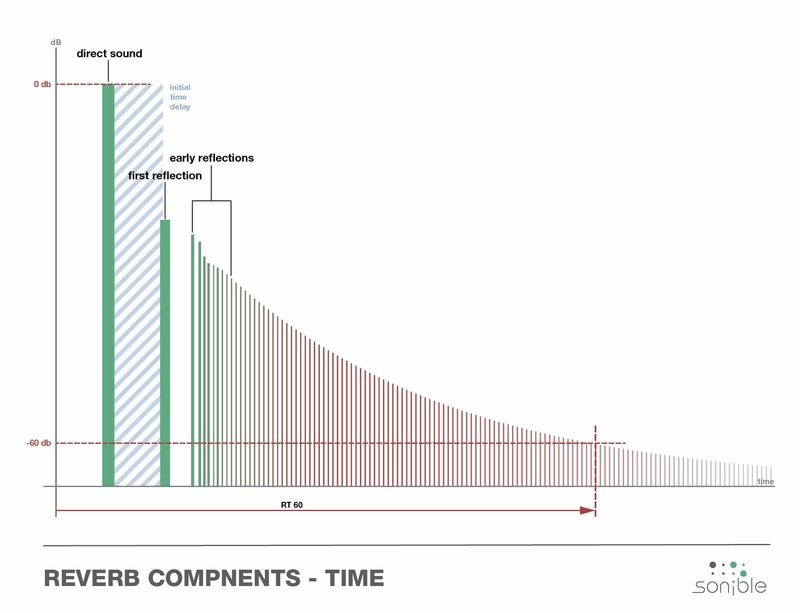 Ambient microphones are placed outside of the reverberation radius in such a way that they record significantly more of the diffuse sound than the original direct sound signal. After the recording session the two signals, ambient and close, can be mixed together to create the desired balance. New possibilities within the digital domain and music information retrieval now allow the elimination of room information from previous recordings. 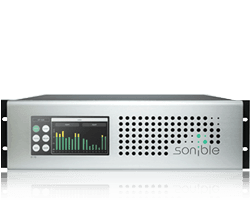 Plug-ins such as the proximity:EQ+ by sonible can distinguish between the direct sound and its reflections. One can therefore “shape” the perceived space of the recording by, for example, recessing the original sound source or pulling it closer to the listener.